A dissemination event took place on 10 February 2010 to mark the end of an inter-disciplinary tapestry monitoring research project undertaken by researchers at the University of Southampton, from the Textile Conservation Centre (Frances Lennard, Principal Investigator, and Dr Dinah Eastop) and the School of Engineering Sciences (Professor Janice Barton and Dr Alan Chambers, Co-Investigators). Reports on the research and its outcomes were presented to and later discussed by representatives of the University of Southampton, other higher education institutions and industry partners such as the National Trust, English Heritage and Historic Royal Palaces. The research team members are grateful to the Institute of Archaeology, UCL for hosting the event. The three-year project was funded by a grant of £386,000 from AHRC, the Arts and Humanities Research Council, and began in January 2007. 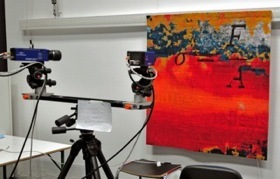 It aimed to enhance the long-term preservation of tapestries by developing well-established engineering techniques to monitor the strain behaviour of tapestries, simply and unobtrusively, in situ. Strain, a measure of the percentage elongation of a material (Sahin et al, 2006), is assumed to lead to damage in the long term. 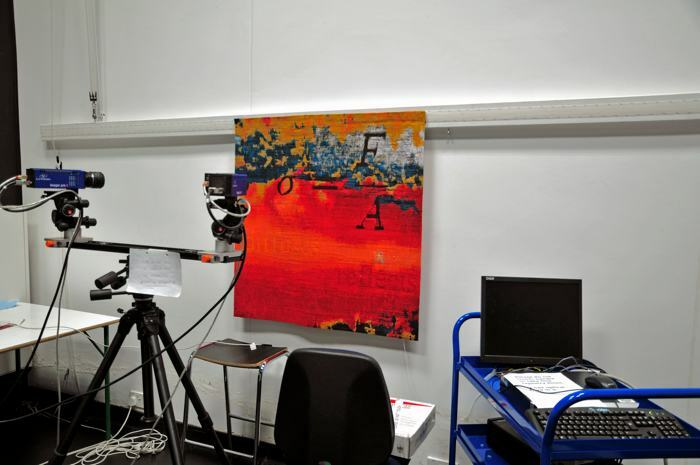 The research set out to question whether tapestries are being pulled apart by their own weight, and also whether it is possible to identify incipient damage before it is visible to the naked eye. 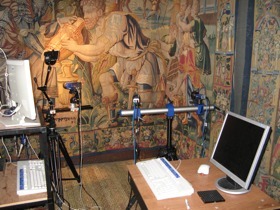 The project objectives were to develop two techniques which an earlier pilot project had identified as the most promising for use on historic tapestries (Dulieu-Barton et al, 2005): optical fibre sensors to obtain point measurements of strain, and a whole-field measurement technique, digital image correlation. The final objective was to combine the two techniques into a hybrid system and use it to monitor tapestry samples in the laboratory, a newly woven tapestry and a historic tapestry in situ in a historic house.